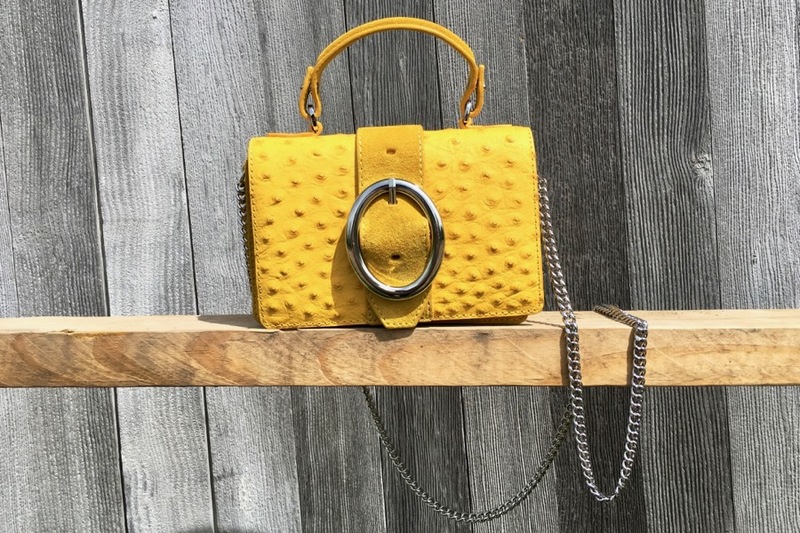 Yellow: What To Wear When The Rain Won't Stop And It's Dampening Your Mood. It snowed again this week. Not a lot. Just enough to require my recently-retired down puffer jacket (cringe). My first instinct was to gripe on Instagram. However, as I scrolled through the posts featuring fashionistas in sunny cities/beaches/gardens, I remembered why I started this blog. Style takes a little effort when you live in a place that sees more clouds than sun, while you’re chasing three kids, or where fashion just isn’t a priority. Sure, we have limitless inspiration from social media and shopping choices from online retailers. It’s just that I’d feel a *little* silly wearing that lace top + shorts + espadrille combo that other influencers are sporting, while I’m standing in the freezing rain at my son’s track meets. As much as I love April, the constant showers can dampen my spirit. Since we’re halfway through the month, it is time for some drastic measures. Hello, yellow. Yellow is thought to evoke optimism, clarity, energy, and joy (move over, coffee obsession). You may also have heard that yellow causes anxiety and makes babies cry. However, Leatrice Eiseman, color guru and executive director of the Pantone Institute, claims that those negative associations are simply rumors started by another color theorist who just didn’t like the color. Who knew there was a scandal in the color world? So why are caution signs yellow? Not for emotional reasons, but simply because it appears brightest to the human eye and is, therefore, most effective at preventing accidents. I must say, it’s easier to find teeny yellow bikinis than outerwear right now, but here are a few choices that offer a little more coverage. This rainjacket from J.Crew is in a mustard color but I think it still qualifies as a mood lifter and weather warrior. For a softer buttery hue, I love this Avec Les Filles raincoat. When it’s pouring outside, you need a bright, cheerful umbrella to keep your body (and sense of humor) dry. If you ever watched the show How I Met Your Mother, you’ll smile under this umbrella. And of course, it wouldn’t be rain season without some bright Hunter boots. If you want a more subtle look, you can add these socks to your neutral color boots. This Daffodil Textured coat from Anthropologie may just stop traffic. This cape from J.Crew is a lovely topper for cooler spring days, or as a cover-up in the summer. Banana Republic has a number of sweaters in different shades of yellow. This silk cashmere sweater is my favorite. Anthropologie is a gold mine this season, especially for gorgeous floral prints. I love this Vineet Bahl blouse, this Shoshana ruffled blouse, and this Yumi Kim wrap. These are great for a pop of color under a neutral spring trenchcoat, blazer or denim jacket. 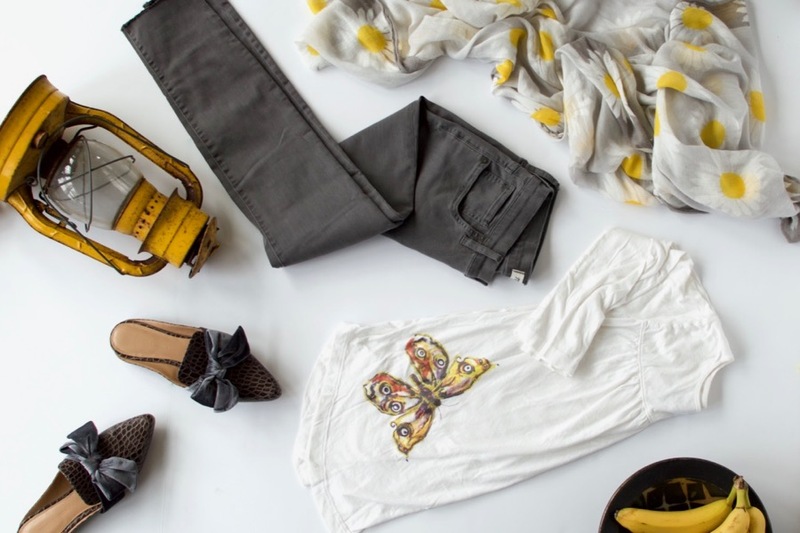 These lemon print jeans are a fun alternative to plain white jeans. This is my one of my favorite handbags (from Banana Republic, a few years ago). Tory Burch has a handbag that’s a similar size and color. There are some gorgeous yellow skirts and dresses in stores right now but most are warm weather pieces. I’ll post my favorites on my Pinterest Boards so that you can add them to your shopping basket when the weather finally cooperates. And if yellow just isn’t a color you like to wear, perhaps Get Happy! : Lessons in Lasting Happiness will look good on your nightstand, and remind you to keep a positive outlook. Drop me a line, in the comments below, or e-mail me at fashionipa@gmail.com. See what I’m wearing on Instagram.